If finding a decent melody was his objective on this cool October eve, U2’s Bono found plenty of them – and plenty of company to share them with – as his Irish mega-band alternately wowed and wooed a crowd of over 60,000 at Carter-Finley Stadium in Raleigh, N.C.
With a harvest moon shining just above the tree line and the band’s massive 164-foot-tall stage – dubbed “The Claw” – perched like some alien spacecraft inside this suddenly-undersized venue, U2 blazed through a blinding, blistering rock spectacle the likes of which the Carolinas may never see again. 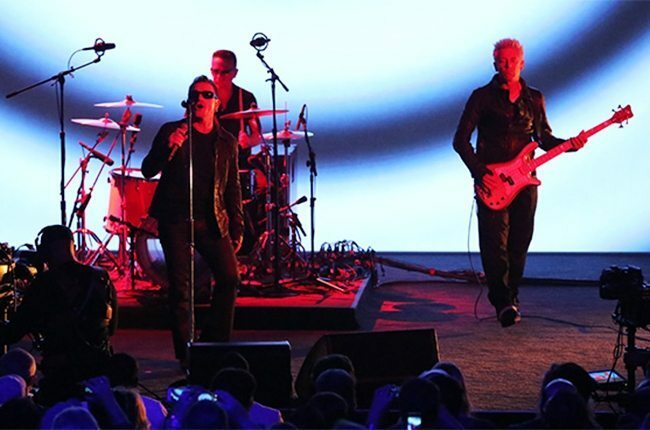 “We’ve got old songs, we’ve got new songs, we’ve got songs we can barely play,” Bono joked during U2’s twenty-three-song set – which spanned three decades of material in a little over two hours. Indeed, along with The Edge, Adam Clayton and Larry Mullen, Jr., “The Claw” was a star of the show in its own right, with its honeycomb video screen pulsating images from the stage while hundreds of speakers blared and lights flashed from its four crab-like legs. 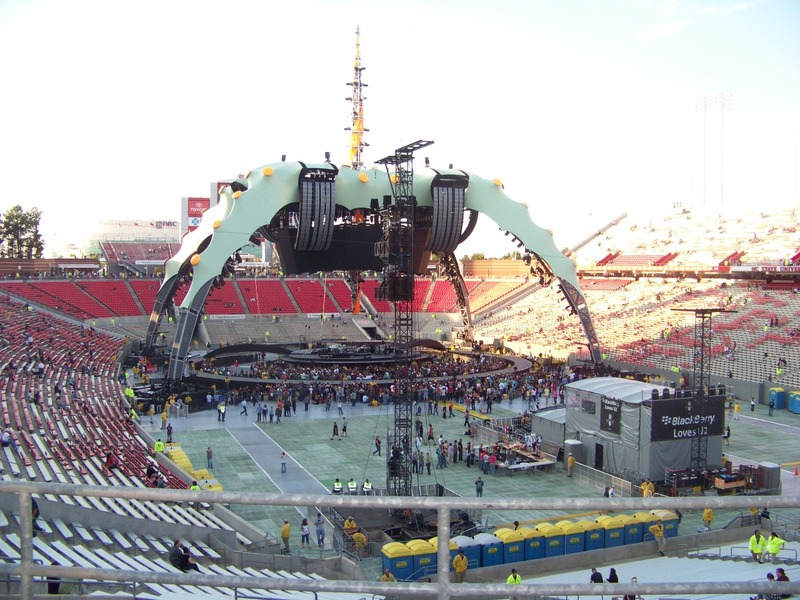 Conceptualized by longtime U2 stage designer Willie Williams, “The Claw” is the tallest, most revolutionary rock-n-roll edifice ever constructed – twice as big as the Rolling Stones’ largest concert stage. 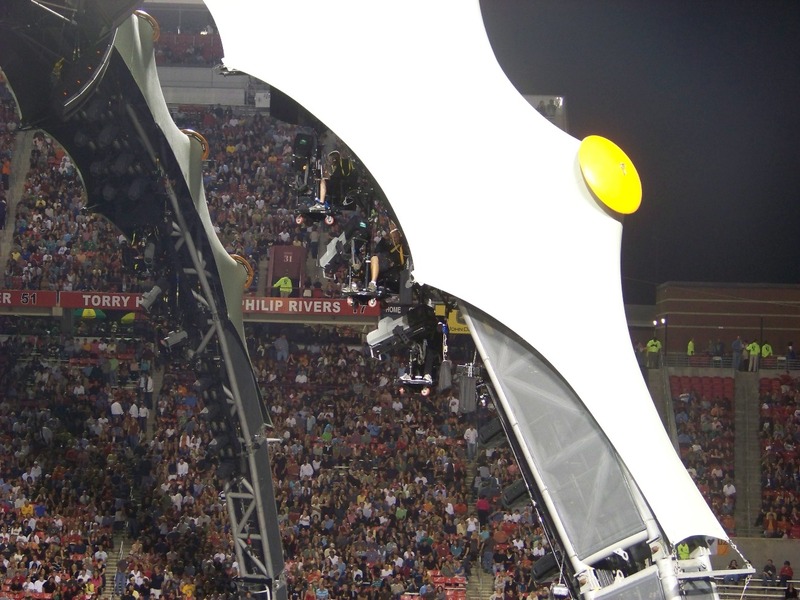 Of course with that size comes “intimacy on a grand scale,” according to Bono, as “The Claw’s” unique suspension design frees up room on the ground for fans and makes the stage visible from every angle. Wherever they sat on this particular night, U2’s fans were treated to a sonic tour de force from the biggest band in the world, as the Irish quartet charged through its dizzying, diverse set list with the frenetic urgency and musical precision of a band that not only wants to stay – but aggressively prove that it belongs – on top. 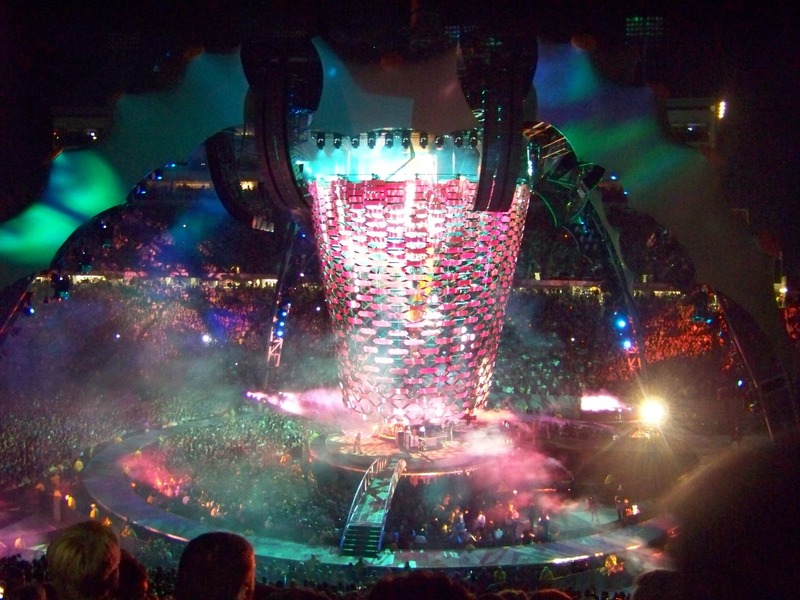 Up-tempo hits like “Beautiful Day,” “Elevation” and “Vertigo” couldn’t have been more thunderously delivered – or ecstatically received – while the classic “New Year’s Day” sounded precisely as it did on our Live Under A Blood Red Sky album, which was recorded twenty-six years ago. 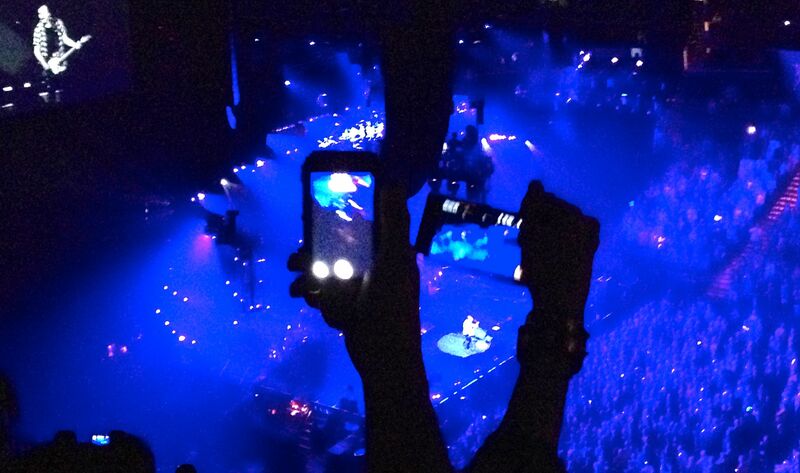 Halfway around the world, a quarter century later, U2 nailed it note for note, people. 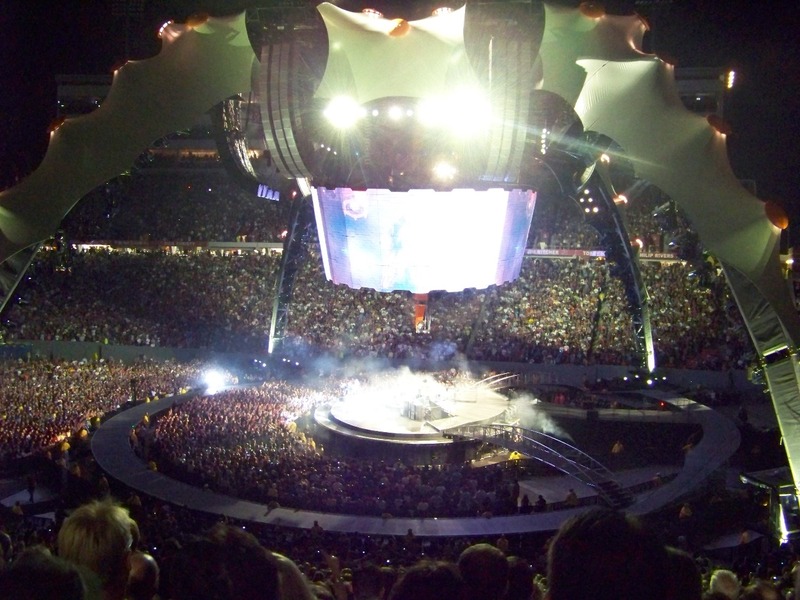 Fans lapped up U2’s new material, too, as the show-opening pulse-pounder “Breathe” and the soaring strains of “Magnificent” (which anyone who has attended a University of South Carolina football game this year has heard) upped the adrenaline ante early in the show. 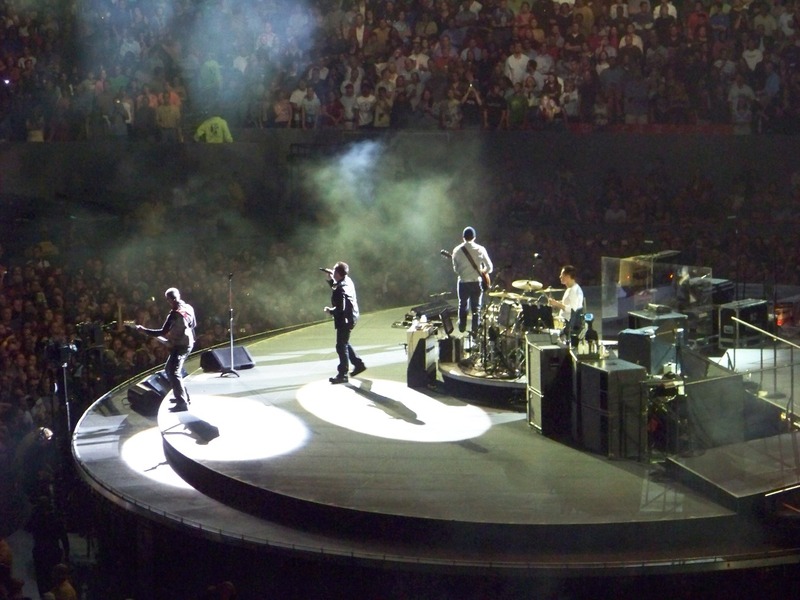 U2 also gave brilliant renditions of its classics “Mysterious Ways,” “The Unforgettable Fire” and “Where The Streets Have No Name,” the latter of which may have been the evening’s most evocatively-delivered number. 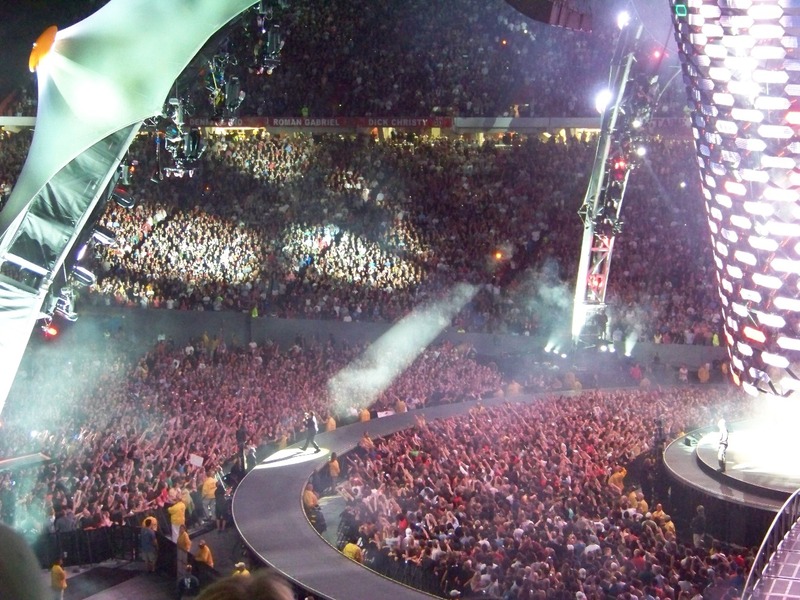 Masters of tension and release, U2 knew exactly when to push and pull the levers of showmanship, working in a few slower, down-tempo numbers amid this unprecedented rock-n-roll spectacle. 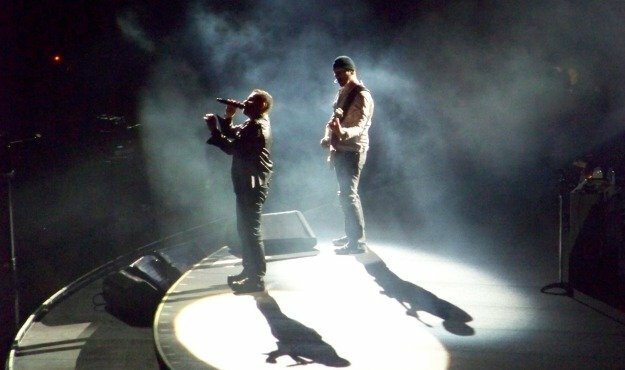 For example, Bono and The Edge played an acoustic version of “Stuck In A Moment You Can’t Get Out Of” which highlighted the intricate vocal harmonies that make U2 so good – but which can easily go unnoticed amid the sensory overload of the world’s biggest rock show. 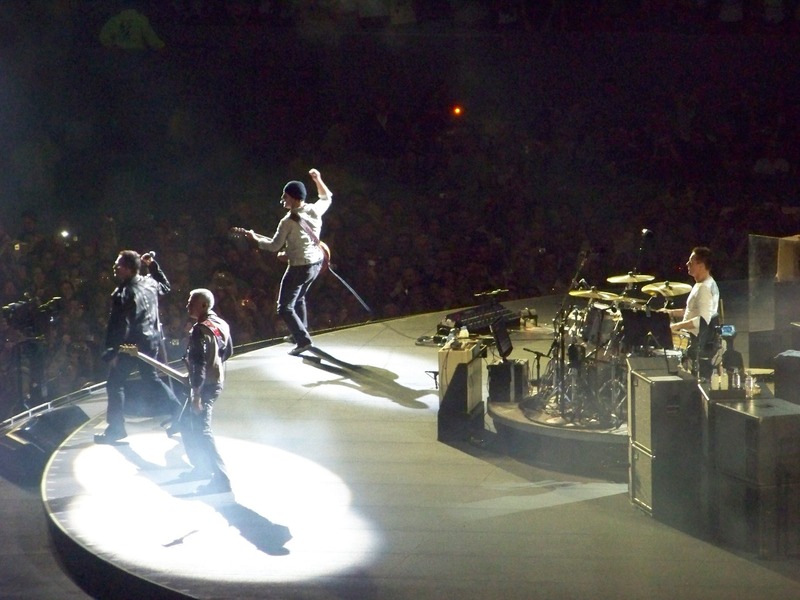 The band also broke out the jangly, 2001 hit “In A Little While,” a song about a hangover that became “a gospel song” when Joey Ramone passed away listening to its soothing strains. It was the first time U2 had played the song on this tour. 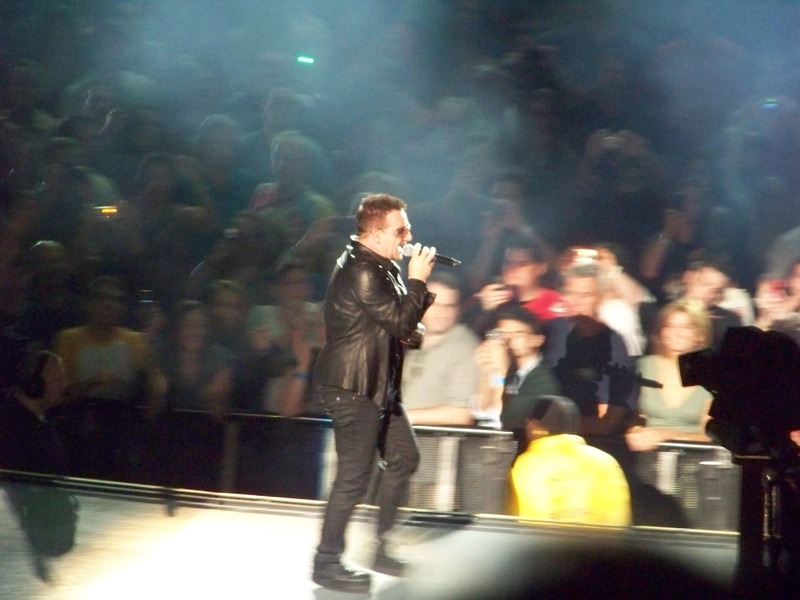 Bono also put the microphone down and allowed the crowd sing a two choruses and a verse of “I Still Haven’t Found What I’m Looking For,” one of the singles from 1987’s The Joshua Tree – arguably the band’s best and most well-known album. 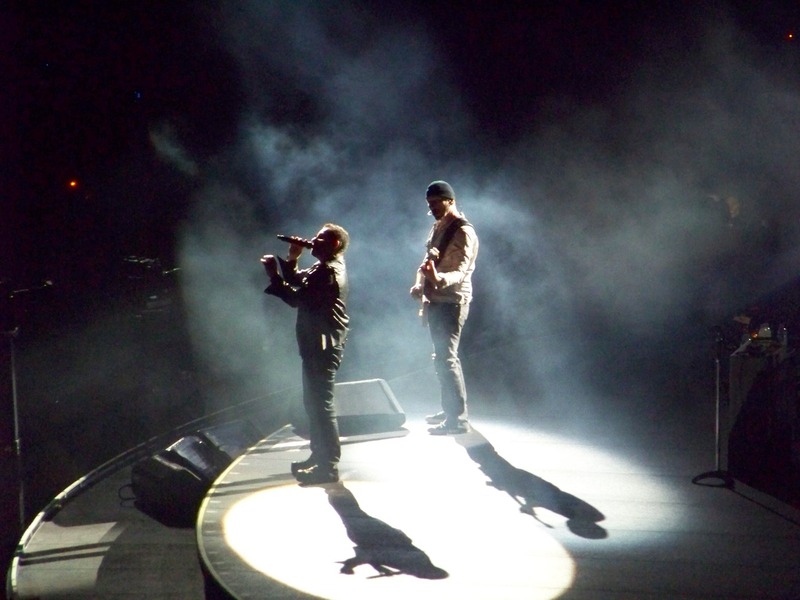 Of course a U2 show wouldn’t be a U2 show without a little sermonizing from Bono, who promoted his “One” campaign during the concert and praised the pro-democracy demonstrators in Tehran, to whom he dedicated the 1983 hit “Sunday Bloody Sunday.” In fact, in one of the night’s more awkward moments, Bono gave “shout outs” to former North Carolina Senators John Edwards and the late Jesse Helms – both of whom he credited with supporting the “One” campaign. 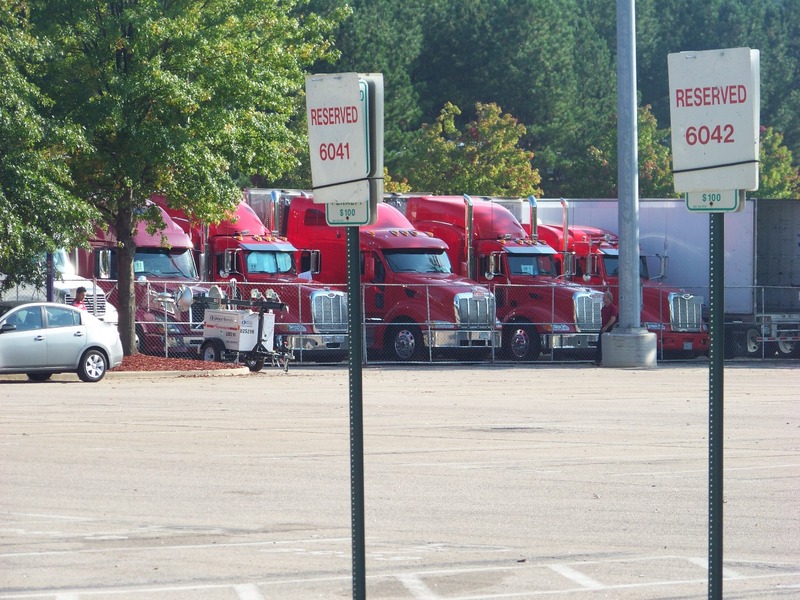 “Only in America,” he said. 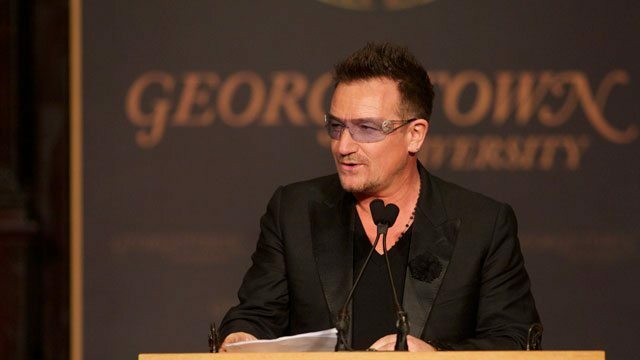 Bono also talked a lot about AIDS in Africa – which would have been fine had he not done it over The Edge’s brilliant guitar solo during “One,” the only real sour note of the evening. 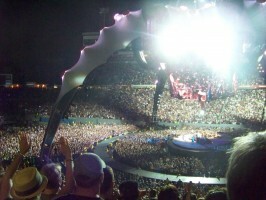 For us, the most poignant moment of the concert was more personal than political, though. 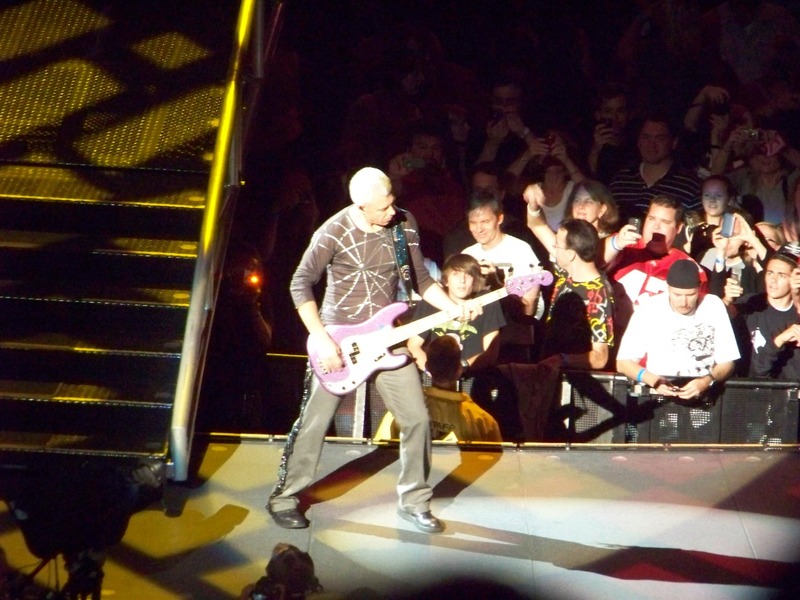 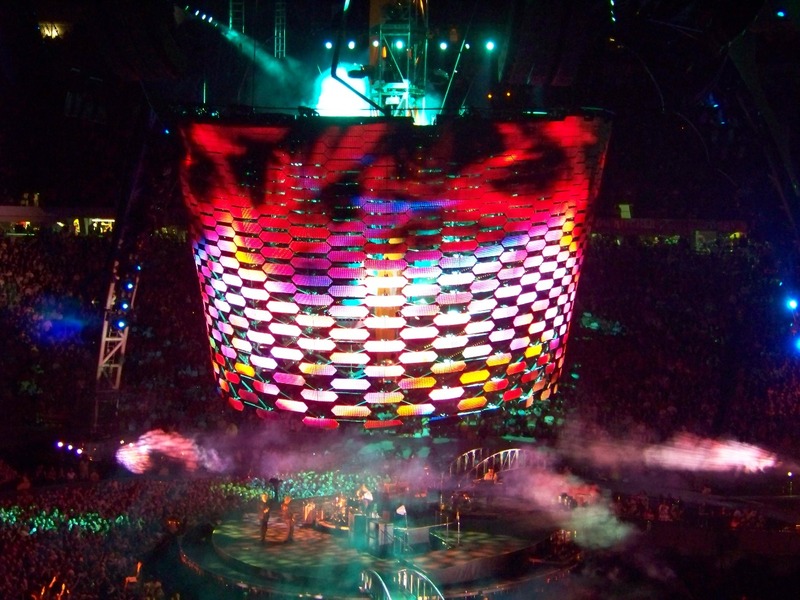 It came during the band’s performance of their 2005 hit “City of Blinding Lights,” as Bono invited a young boy to traverse the circular walkway with him – seemingly mirroring the trajectory of life. At the end of the song, Bono waved goodbye to the young lad, like a man saying goodbye to his own past. 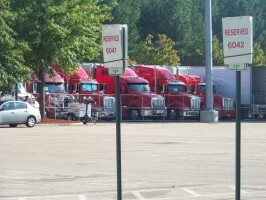 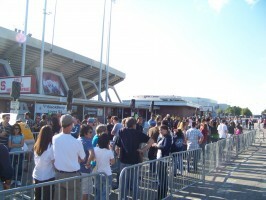 Caption (^): Fans wait to enter Carter-Finley Stadium in Raleigh, N.C. for U2’s performance there on October 3, 2009. 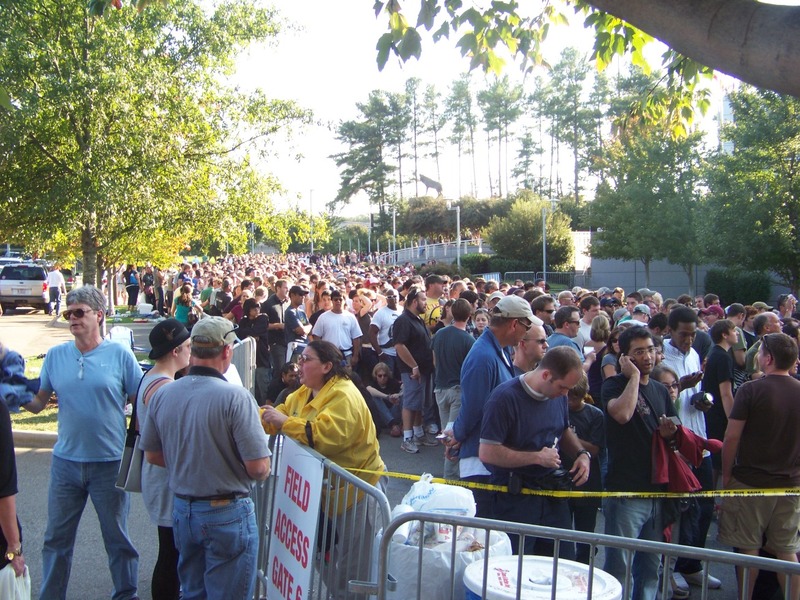 Caption (^): Fans with general admission floor seats wait to enter Carter-Finley Stadium in Raleigh, N.C. for U2’s performance there on October 3, 2009. 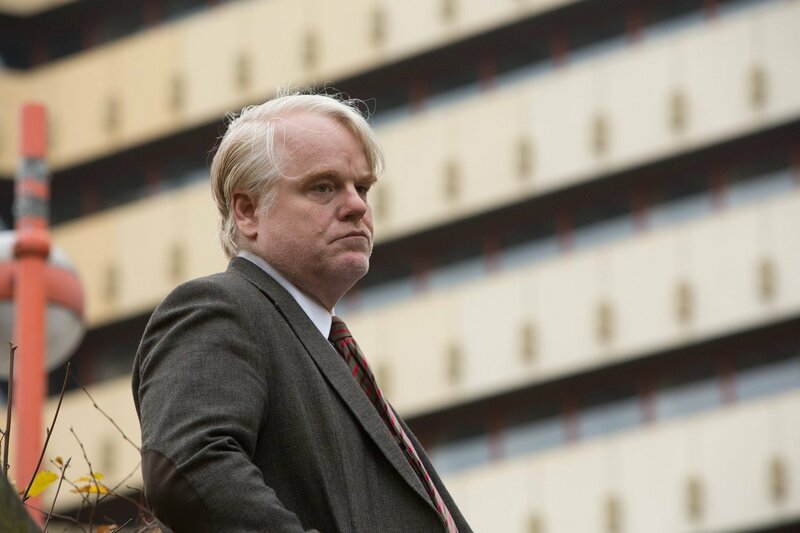 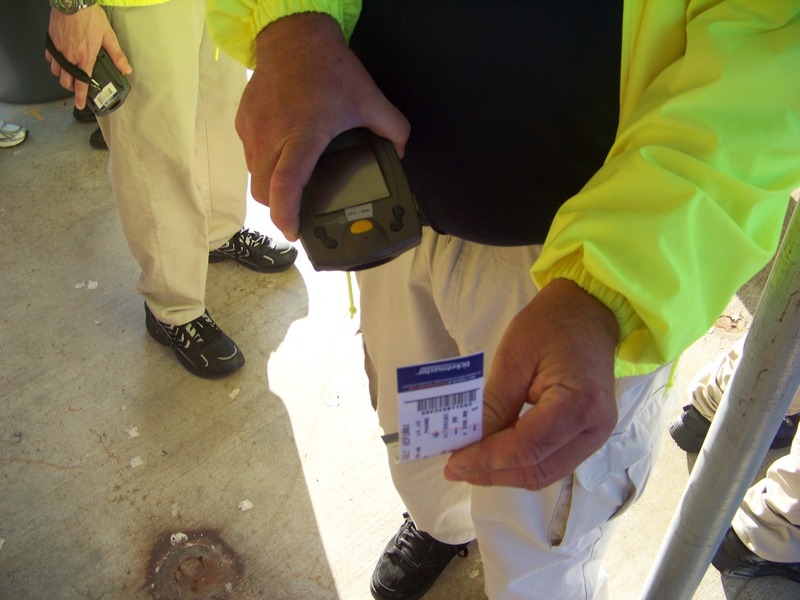 Caption (^): The U2 ticket belonging to FITS founding editor Sic Willie is scanned. Caption (^): “The Claw …” the centerpiece of the U2 360 tour – and the largest rock-n-roll stage ever erected – barely fits into Carter-Finley stadium in Raleigh, N.C. 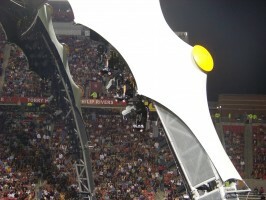 This “Claw” is actually one of three that leapfrog from city-to-city on the tour. Caption (^): “The Claw” as viewed from Sic Willie’s seat prior to the start of U2’s concert at Carter-Finley Stadium in Raleigh, N.C. on October 3, 2009. Caption (^): U2 performs the song “Breathe” off its latest album No Line On The Horizon at Carter Finley Stadium in Raleigh N.C. on October 3, 2009. 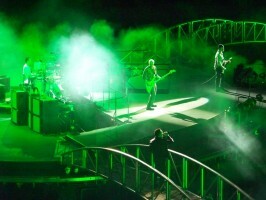 Caption (^): U2 performs at Carter-Finley Stadium in Raleigh N.C. on October 3, 2009. 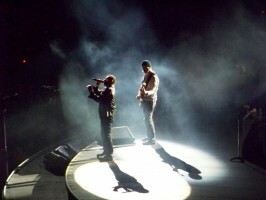 Caption (^): U2’s Bono and The Edge perform the song “In A Little While” off of U2’s 2000 album All That You Can’t Leave Behind at Carter-Finley Stadium in Raleigh, N.C. on October 3, 2009. 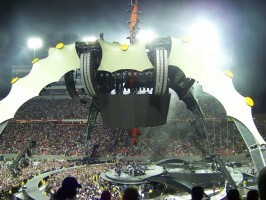 Caption (^): “The Claw” lights up as U2 performs at Carter-Finley Stadium in Raleigh, N.C. on October 3, 2009. 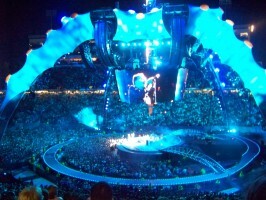 Caption (^): U2 performing the song “Elevation” off of the band’s 2000 album All That You Can’t Leave Behind at Carter-Finley Stadium in Raleigh, N.C. on October 3, 2009. 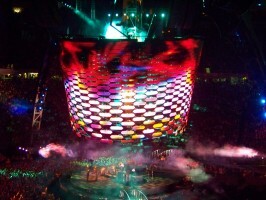 Caption (^): The unique honeycomb video screen at the center of “The Claw” begins to descend during U2’s concert at Carter-Finley Stadium in Raleigh, N.C. on October 3, 2009. Caption (^): U2 performs the title track to its 1984 album The Unforgettable Fire at Carter-Finley Stadium in Raleigh, N.C. on October 3, 2009. 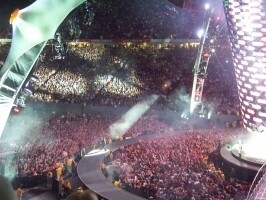 Caption (^): The spotlight finds Bono amid a sea of fans as U2 performs “City of Blinding Lights” 2005 album How To Dismantle An Atomic Bomb at Carter-Finley Stadium in Raleigh, N.C. on October 3, 2009. Caption (^): U2’s Adam Clayton performs at Carter-Finley Stadium in Raleigh, N.C. on October 3, 2009. 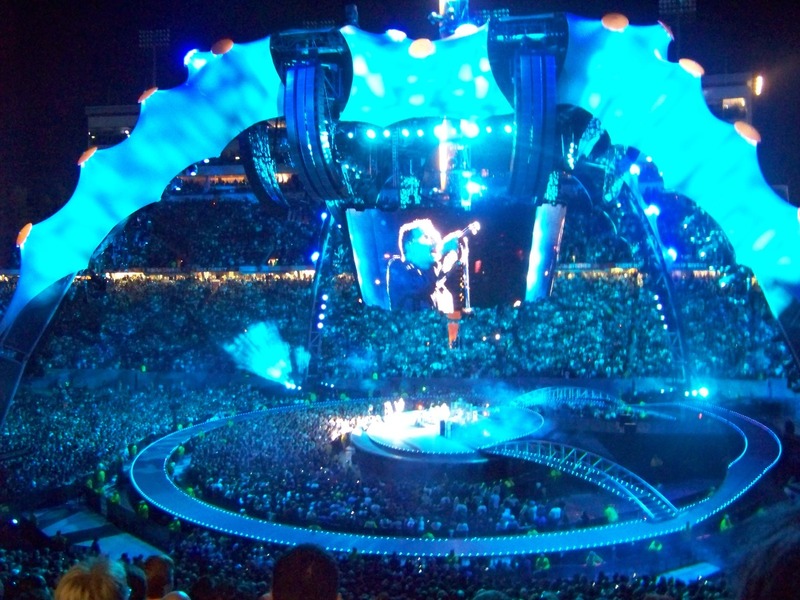 Caption (^): U2’s Bono races around the circular stage at Carter-Finley Stadium in Raleigh, N.C. on October 3, 2009. 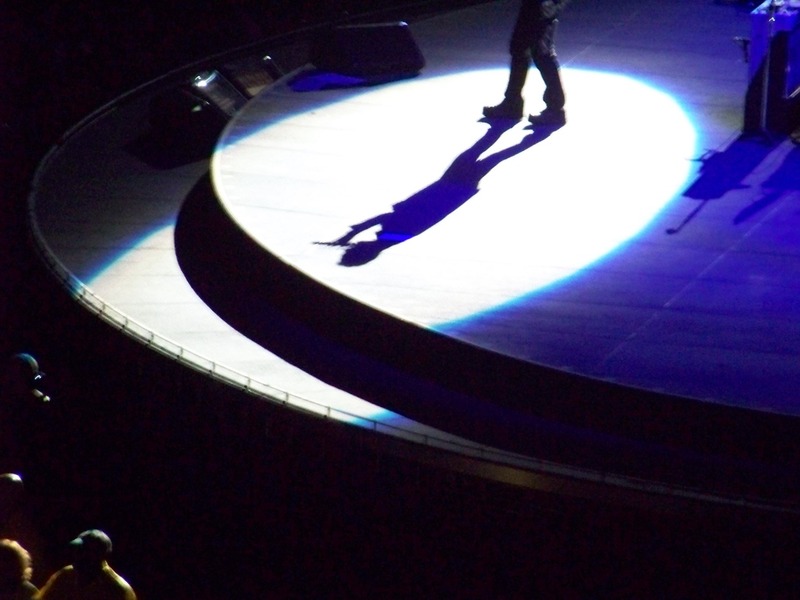 Caption (^): Bono casts a singing shadow during U2’s concert at Carter-Finley Stadium in Raleigh N.C. on October 3, 2009. Caption (^): “The Claw” lights up during U2’s encore performance at Carter-Finley Stadium in Raleigh N.C. on October 3, 2009. 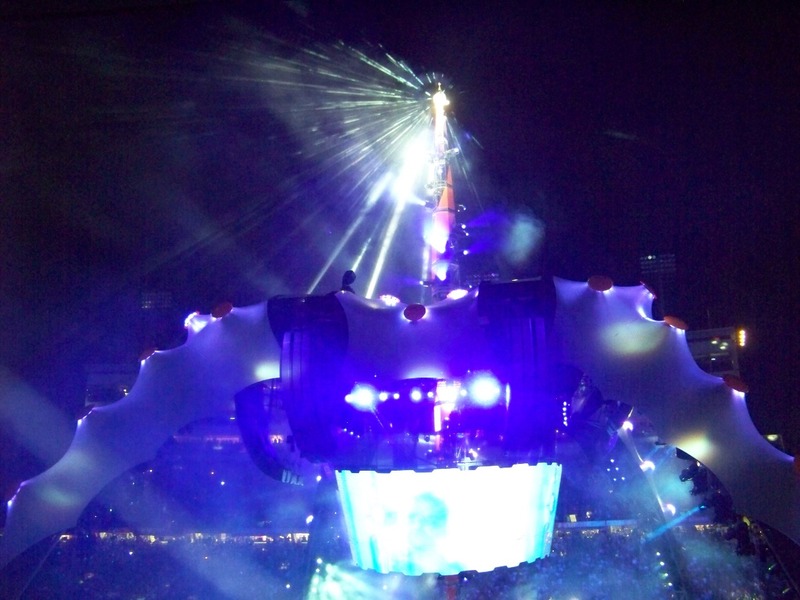 Caption (^): As U2 plays “With or Without You,” the disco ball atop “The Claw” shoots light throughout Carter-Finley Stadium in Raleigh N.C.